The Packers dominated a majority of the first half, scoring 21 early points on the strength of two QB Aaron Rodgers touchdown passes to WRs Devante Adams and Randall Cobb and a RB Aaron Jones touchdown run. The Bears would score on a QB Mike Glennon touchdown pass to WR Kendall Wright just before halftime. While RB Jordan Howard would find the endzone for the Bears, WR Jordy Nelson would catch two touchdown passes from Rodgers and the Packers would go on to win 35-14. With that, we give you our PFF exclusive takeaways from the contest for each team. Rodgers was efficient but didn’t need to make any big time throws in this game to beat the Bears. Rodgers played a very quick passing game, releasing the ball an average of 2.28 seconds after the ball was snapped. He picked the Bears apart when kept clean (75 percent of dropbacks), completing 17-of-21 passes for 121 yards and 4 touchdowns when not under pressure. While Taylor’s grade isn’t anything to write home about regularly, it’s impressive considering the situation. Taylor is a guard that was forced to play at left tackle due to injuries, so this could’ve easily been a disaster for the Packers. But Taylor held his own, allowing just one quarterback hurry on 31 pass-blocking snaps, and he also finished with a run-blocking grade of 74.2. The Packers defense struggled to get after Mike Glennon, pressuring him on only seven dropbacks all game long. It was encouraging though that Matthews notched himself three pressures on the day and was the Packers highest-graded pass-rusher. He’s now had multiple pressures in every game this year. After Damarious Randall got benched, Hawkins saw the majority of the snaps in the second half and held up well. He was targeted six times and allowed only three catches for 30 yards. He also had a pass breakup and two coverage stops. It got ugly for Glennon, who was so bad the Bears didn’t even try to attempt a comeback with him down four scores at the start of the fourth quarter. The weather didn’t help, but Glennon kept airmailing receivers over the middle of the field – a cardinal sin at the quarterback position. He went only 5-of-14 on passes targeted 10+ yards downfield. He only completed one pass that was targeted 20-plus yards down field. After missing last week, Sitton was back to his usual self against his old team. Switching back to the left side, Sitton didn’t allow a single pressure all day long and was solid in the run game. It was a solid game for Amos, who finished as the highest-graded defender on the Bears defense in a game they’d like to forget. 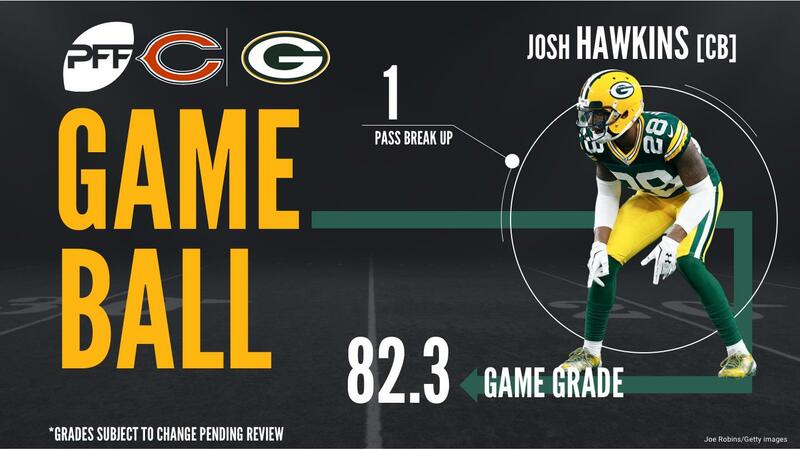 He was effective at defending the middle of the field for the Bears, and was successful when he was actually targeted. It was only twice, but he made a tackle for a very short gain on one, and then secured a stop on third down on the other. Hicks didn’t do much in the pass-rushing game, getting just one quarterback hurry on 25 pass-rushes. But he was very impressive in the run game, finishing with a game-high 86.1 run-defense grade. Hicks made two solo run stops and also had a couple other plays in which he blew up the intended point of attack and forced the running back to look somewhere else, usually to little success.